Dark Brotherhood Sanctuary is the center of operations for the Dark Brotherhood, just east of the Great Chapel of Arkay and under the Abandoned House in Cheydinhal. It is rumored that Count Andel Indarys knows the location of the Sanctuary, but is bribed and threatened to keep his mouth shut. As a result, he does not even acknowledge the Abandoned House under which the sanctuary is located. 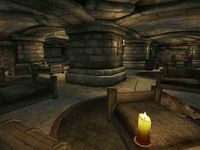 The building is divided into the Dark Brotherhood Sanctuary, the Dark Brotherhood Living Quarters, and the Dark Brotherhood Training Room. Dark Brotherhood quests are given here by Vicente Valtieri and Ocheeva, as well as a miscellaneous quest given by Teinaava. M'raaj-Dar, the sanctuary's mage, sells spells with unusual magicka costs and some unique items. Telaendril is the sanctuary's archer, Gogron gro-Bolmog is its warrior, and Antoinetta Marie is a new recruit. Vicente is always somewhere in the main chamber or in the sleeping quarters. Ocheeva is either in the main chamber, or in the training room hitting a dummy with a dagger while in sneak mode. M'raaj-Dar is usually found in the hallway connecting Ocheeva's and Vicente's rooms, sleeping in the living quarters, or practicing spellcasting on a target in the practice room. Gogron and Antoinetta spend time training or else in the living quarters. Telaendril can be the hardest to find because she is constantly spying or traveling. Antoinetta is found at the training room and the living quarters. During the course of the Dark Brotherhood quests, all of the Sanctuary's inhabitants are killed, and are no longer available. Arquen remains at the Sanctuary; you can report to her weekly with The Night Mother's orders and for your share of the Sanctuary's profits. Up to three low-level Dark Brotherhood recruits will take up residence there, one of whom can teach the same spells M'raaj-Dar did. 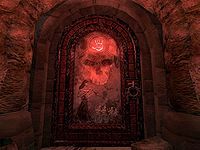 Until Eliminator rank in the Dark Brotherhood when the key to the well is acquired, the only accessible entrance to the Sanctuary is through the abandoned house's basement, which leads into a hallway on the extreme east end of the area. A copy of The Five Tenets can be found on the table next to the large pillar upon entering the large open area, and a copy of the sneak skill book The Wolf Queen, v 6 sits on a bookshelf in the northwest corner. In the southwest corner a ladder leads up to the well in Cheydinhal between the abandoned house and Oghash gra-Magul's house. The door on the wall on the right (assuming that you've entered through the basement) leads to the living quarters, while the one on the left hand wall leads to the training room. The hallway next to the bookshelf leads to a door to a bedroom and a stairway leading down. The door opens on Ocheeva's room, with her bed and a trapdoor to Vicente's room on the northern end and a single food barrel on the southern end. The stairway leads to Vicente's room which holds a cupboard and chest of drawers that contain clothing as well as two clutter barrels, and Vicente's stone bed, chest, and desk. The chest contains a chameleon potion, four samples of human blood, and 25 gold. The desk holds Vicente's Note to Ocheeva. Vicente's chest and desk are the only non-respawning containers in these areas; the rest are unsafe for long-term storage. 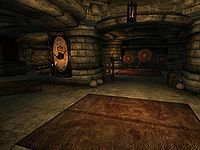 In the living quarters, the hallway into the main room holds three barrels and a crate; the crate and one of the barrels contain clutter, the other two contain food. 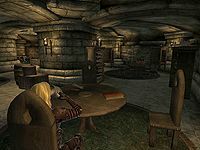 The eastern half of the room is a sleeping area, with five beds and chests belonging to (clockwise around the wall): M'raaj-Dar, Telaedril, Gogron, Teinaava, and Antoinetta. M'raaj-Dar's chest, locked with a very hard lock, contains three scrolls; one fortify health, one invisibility, and one open, and the barrel next to it holds clutter. Telaendril's chest holds random enchanted jewelry and arrows and is locked with a very hard lock, while Gogron's, also locked with a very hard lock, holds random armor and weapons and a sack next to it holds clutter. Teinaava's chest contains random weapons and enchanted arrows, as well as a copy of the marksman skill book The Black Arrow, v 2 and is locked with a hard lock. Antoinetta's chest, locked with an average lock, holds an four carrots, four samples of garlic, four heads of lettuce, three onions, two pieces of mutton, and two mandrake roots, and the three sacks between it and Teinaava's all hold clutter. All of the chests can be opened with keys in the possession of the NPC. The western half of the room holds a clutter barrel and two crates with the same contents against the pillar, with a wine rack on the other side that holds twelve bottles of Tamika's West Weald Wine, four bottles of Surilie Brothers Wine, and three bottles of cheap wine. The cupboard opposite the wine rack holds various three ears of corn two apples, and a carrot, with another carrot on the floor behind it, and contains silverware. The table here holds five apples, four pieces of boar meat, four bottles of beer, and two bottles of ale. The cupboard behind the table contains drinks as well, with four bottles of mead on top of it and a fifth on the floor next to it. The other cupboard on this same wall contains food. The chests of the residents and the sacks between them are the only non-respawning containers; the rest are unsafe for long-term storage. Schemer, the Sanctuary's domestic rat, wanders aimlessly around the room. The center of the training room contains only three clutter sacks and a single chest; the chest holds a copy of the light armor skill book The Rear Guard and a copy of the marksman skill book The Gold Ribbon of Merit along with some clutter. The western portion of the room holds a clutter barrel with a copy of the hand to hand skill book Ahzirr Traajijazeri, a weak poison of weakness, and a weak poison of fatigue on top. In the western portion of the room are another five clutter barrels and four clutter sacks. The barrels and chest respawn, but the sacks do not. 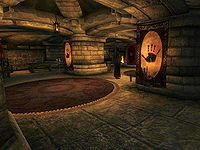 Ocheeva states that there are other sanctuaries located in Cyrodiil, each overseen by a Speaker of the Black Hand. Given that there are four speakers, it can be assumed that there are four sanctuaries in total. Only the Cheydinhal Sanctuary (overseen by Lucien Lachance) is accessible. Scheduled for Execution: An old "friend" in the Imperial Prison needs to be released... from living. The Renegade Shadowscale: Eradicate a fugitive Shadowscale named Scar-Tail and bring back his heart as proof for Teinaava. In Skyrim, it is revealed that the Sanctuary is destroyed in the Fourth Era. Esta página foi modificada pela última vez à(s) 03h51min de 5 de setembro de 2014.